Vancouver, BC (March 24, 2015) - The Flag Shop is pleased to celebrate the 5th anniversary of the MAPLE LEAF TARTAN as the officially designated tartan that ALL Canadians can wear and display regardless of their ancestry. We invite members of the press to visit our production department in VANCOUVER on Thursday March 26 or Friday March 27, by appointment, to view the MAPLE LEAF TARTAN flag being produced on our newly installed high technology digital fabric printer – the TELEIOS GT. Please contact me directly at 604-736-8161 or president@flagshop.com to schedule an appointment. For centuries, tartans have been used to represent the identity and cohesion of families, communities, military units, organizations and regions. While traditionally synonymous with Scottish heritage, tartans have also been approved for non-Scottish organizations and on March 3, 2010 the MAPLE LEAF TARTAN was designated as Canada’s Official National Tartan. The MAPLE LEAF TARTAN incorporates the green of the leaves' summer foliage, the gold which appears in early autumn, the red which appears with the coming of the first frost, and the brown tones of the fallen leaves. It is a tartan that can be proudly worn and displayed by ALL citizens of this amazing country. April 6, 2015 is CANADA TARTAN DAY. Canadians from across the country will join together to celebrate the contributions that over four million Canadians of Scottish heritage continue to make to the foundation of this amazing nation. It is a day of festivities that typically include parades of pipe bands, Highland dancing and sports, and other Scottish-themed events. Tartan Day is also a special day for Canadians to celebrate their national, provincial, territorial or personal tartans. As a Canadian citizen of any ancestral descent, you now have the MAPLE LEAF TARTAN to help identify you as a proud Canadian. Scheduled across Canada from March to October, 2015, Highland Games and Festivals originated among the Scots’ Celtic ancestors and became a customary part of their lives. Events such as tossing the caber and putting the stone, and competitions in playing bagpipes and Highland dancing, formed the core of the festival. With over 50 Canadian cities hosting Highland Games events in 2015, from coast to coast there will be many opportunities to experience the massing of the pipe bands, athletic and sports competitions, musical entertainment, and showcasing of traditional and modern Celtic arts. Join the numerous clan societies that make the Highland Games a highlight of the festival season and wave your MAPLE LEAF TARTAN flag - proudly! The Flag Shop is excited and pleased to announce our partnership with Alan Wilson of Highland Line International. 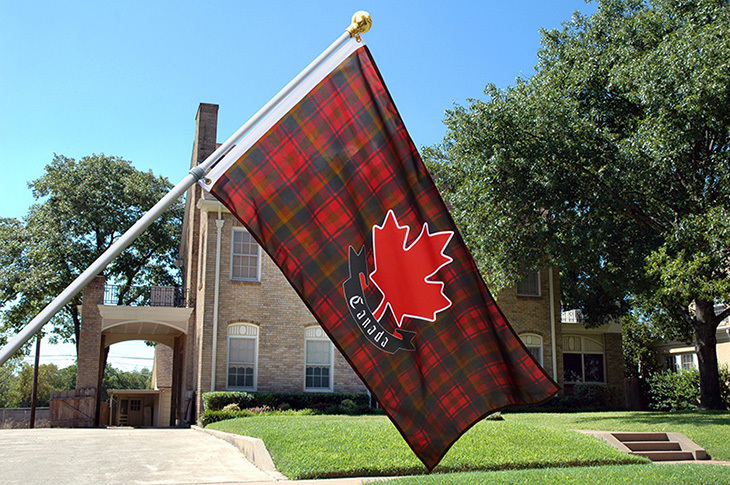 The 27” x 54” MAPLE LEAF TARTAN flags digitally printed on our wind-resistant knitted polyester will be available at all 13 Flag Shop locations from coast to coast at a price of $99 each. Cottage Flag Kits will be available within a few weeks. Please contact The Flag Shop location nearest you to order yours today. The Flag Shop tartans can be found at www.scottishtartanflags.ca. The Flag Shop is Canada’s leading manufacturer of flags and banners. We are 100% Canadian Owned and offer a one stop shopping for all patriotic paraphernalia, world flags, flagpoles and all flag-related products. FLY THE MAPLE LEAF TARTAN FLAG! The Flag Shop has been making flags for over 40 years and was the first retail flag store in the world! If you have any questions please contact The Flag Shop nearest you. Founded in 1975 in Vancouver, Canada, The Flag Shop is the leading manufacturer in Canada for flags and banners, and was the first specialty flag store of its kind. 100% Canadian owned with headquarters in Vancouver, British Columbia. The Flag Shop currently has 13 locations from coast to coast across Canada. We use top quality fabrics to make your flags and banners and are the only company in Canada to produce 100% recycled banner fabric - Echotex®. We provide professional consultation and design guidance before your project goes into production and with 40 years in the business our products, services and expertise set us apart from the rest of the competitors. The Flag Shop is your one-stop shop for all your flag and banner needs. For more information please visit www.flagshop.com. ©The Flag Shop. All rights reserved. Other company names and/or products are for identification purposes and are the property of, and may be trademarks of, their respective owners.